To increase transparency of our business, for our shareholders and investors, as well as our customers, employees, people in local communities and whole society, and to enable fair and efficient operation of the company, DMG MORI CO regards enhancement of the Corporate Governance and corporation monitoring function as important tasks. DMG MORI CO will continue to make an effort to improve corporate value with long-term stability and make further steps for corporate operation based on higher levels of corporate ethics. The Board of Directors meets regularly and whenever necessary to debate important management issues, and to make decisions through active discussions at which opinions are stated freely. In addition, by limiting the term served by Board members to one year, we have put in place a system that clarifies the mission and responsibilities of the directors. We instituted Management Councils with the President as chairperson in 2006, and Operating Officers’ Meetings in 2009 to speed up the decision-making process and the soundness of our administration. In addition, Management Meetings attended by the directors, operating officers and general managers are convened once a month to fully share and manage the progress on important issues and basic strategies, strengthening the corporate governance of the DMG MORI Group as a whole. In recent years, international concern has grown concerning measures to prevent the proliferation of weapons of mass destruction and the excess stockpiling of conventional weapons. To address this concern, the DMG MORI Group has set up an Export Control Committee, with the President as chairperson. This committee formulates the internal regulations (the Compliance Program), reviews and changes the contents of the regulations to ensure compliance with export control laws, and conducts rigorous discussions on matters such as the propriety of exports of our products. In 2005, as part of the establishment of our internal control system, we set up an Information Disclosure Control Committee, with the executive officer of the Administrative Headquarters as its chairperson, to act as an advisory body deciding rules for the disclosure of information, to improve the transparency and soundness of our management. 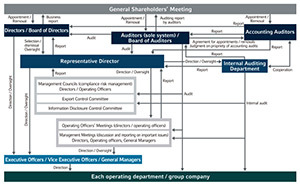 In accordance with the auditing policy, the auditors attend meetings of the Board of Directors, Operating Officers’ Meetings, Management Meetings and other key meetings, where they express their opinions. In addition, they read documents about important decision, and conduct strict audits in every department at the Head Office, as well as each campus, technical center and consolidated group company. Through these process, we have sought to achieve a fast decisionmaking process with a small number of directors and energize the Board of Directors. We have revamped our management by establishing a compliance system, and we have established an efficient corporate governance system with an increased level of fairness and transparency in management.